NEW YORK, NY / ACCESSWIRE / April 1, 2019 / Global Self Storage, Inc. (NASDAQ: SELF) (the ''Company''), a real estate investment trust that owns and operates self storage properties, reported results for the fourth quarter and full year ended December 31, 2018. The Company's total revenues increased 6.6% to $2.1 million, total expenses increased 2.1% to $1.8 million, and operating income increased 49.5% to $276,000. Net income totaled approximately $75,000, or $0.01 per fully diluted share, for the fourth quarter of 2018 compared to net loss of $21,000, or $0.00 per fully diluted share, for the fourth quarter of 2017. Funds from Operations (''FFO'') and Adjusted FFO (''AFFO'') totaled $0.05 and $0.08 per share, respectively, for the fourth quarter of 2018 compared to $0.04 and $0.04 per share, respectively, for the fourth quarter of 2017. This represents total FFO and AFFO growth of 20.3% and 79.5%, respectively, for the fourth quarter of 2018 versus the same time period in 2017. Same-store revenues increased 5.3% to $1.9 million. Same-store net operating income (“NOI'') increased 28.4% to $1.1 million. Combined same-store and non same-store (''Combined store'') revenues increased 6.6% to $2.1 million. Combined store NOI increased 28.3% to $1.3 million. Combined store leasable square footage at quarter end increased 2.3% to 766,000. Combined store overall square foot occupancy at quarter end increased 50 basis points to 92.5%. Combined store total annualized revenue per leased square foot increased 3.6% to $11.71. The Company's total revenues increased 8.5% to $8.1 million, total expenses decreased 1.6% to $6.7 million, and operating income increased 110.4% to $1.4 million. 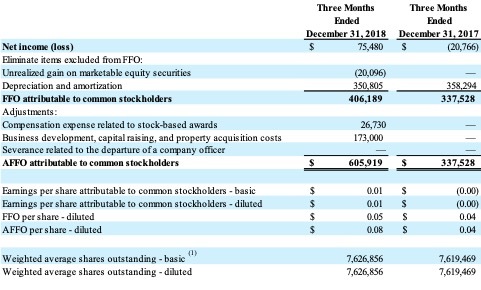 Net income totaled approximately $619,000, or $0.08 per fully diluted share, for the full year ended December 31, 2018 compared to net loss of $146,000, or $0.02 per fully diluted share, for the full year ended December 31, 2017. FFO and AFFO totaled $0.26 and $0.30 per share, respectively, for the full year ended December 31, 2018 compared to $0.20 and $0.21 per share, respectively, for the full year ended December 31, 2017. This represents total FFO and AFFO growth of 28.9% and 39.6%, respectively, for the full year ended December 31, 2018 versus the same time period in 2017. Same-store revenues increased 7.7% to $7.3 million. Same-store NOI increased 11.7% to $4.3 million. Combined store revenues increased 8.6% to $8.1 million. Combined store NOI increased 12.0% to $4.8 million. Combined store total annualized revenue per leased square foot increased 5.5% to $11.46. Distributed dividends of $0.26 per share of common stock. Capital resources totaled $3.1 million, comprised of $1.5 million of cash and cash equivalents and $1.6 million of marketable securities. In addition, the Company secured a $10 million revolving credit line facility in December 2018, with interest payable at one-month LIBOR plus 3.00%. The Company's fourth quarter total revenues increased 6.6%, total expenses increased 2.1%, and operating income increased 49.5%. The increase in operating income was driven primarily by the expansion of the Company's Merrillville, IN store, as well as higher rental and occupancy rates. For the fourth quarter of 2018, net income totaled $75,000 compared to net loss of $21,000 for the fourth quarter of 2017. The Company's same-store portfolio for the fourth quarter of 2018 included ten of its eleven stores, representing 87.2% of store NOI for the quarter. For the fourth quarter of 2018, same-store revenues increased 5.3% to $1.9 million compared with approximately $1.8 million for the fourth quarter in 2017. The increase was driven primarily by the 4.1% increase in total annualized revenue per leased square foot, which was due primarily to existing tenant rate increases, an increase in available climate-controlled leasable square feet compared to available leasing parking square feet, and, to a lesser extent, increased move-in rental rates and decreased move-in rent ''specials'' discounting. Same-store operating expenses in the fourth quarter of 2018 totaled $755,000 compared with $904,000 in the fourth quarter of 2017. The decrease was primarily driven by the loss of the Company's Class 8 tax incentive and subsequent property expense at the Dolton, IL property, which was recorded during the fourth quarter of 2017. The decrease was partially offset by higher store level employment costs. For the fourth quarter of 2018, Combined store revenues increased 6.6% to $2.1 million compared with $1.9 million for the fourth quarter of 2017. The increase was driven primarily by a 2.9% increase in net leased square footage and by the results of the Company's revenue rate management program of raising existing tenant rates. The increase in net leased square footage was a result of the Company’s Merrillville, IN store expansion, which was completed in January 2018. Combined store operating expenses in the fourth quarter of 2018 totaled $812,000 compared with $961,000 in the fourth quarter of 2017. The decrease was primarily driven by the loss of the Company's Class 8 tax incentive and subsequent property expense at the Dolton, IL property, which was recorded during the fourth quarter of 2017. The decrease was also driven by reduced advertising and marketing costs, but was partially offset by higher store level employment costs. The Company's total revenues for the full year ended December 31, 2018 increased 8.5%, total expenses decreased 1.6%, and operating income increased 110.4%. The increase in operating income was driven primarily by the expansion of the Company's Merrillville, IN store, as well as higher rental and occupancy rates. For the full year ended December 31, 2018, net income totaled $619,000 compared to a net loss of $146,000 for the same period in 2017. The Company's same-store portfolio for the full year ended December 31, 2018 included ten of its eleven stores, representing 88.1% of store NOI for the period. For the full year ended December 31, 2018, same-store revenues increased 7.7% to $7.3 million compared with $6.8 million for the full year ended December 31, 2017. The increase was driven primarily by the 6.5% increase in total annualized revenue per leased square foot, which was due primarily to existing tenant rate increases, an increase in available climate-controlled leasable square feet compared to available leasing parking square feet, and, to a lesser extent, increased move-in rental rates and decreased move-in rent ''specials'' discounting. For the full year ended December 31, 2018, Combined store revenues increased 8.6% to $8.1 million compared with $7.5 million for the full year ended December 31, 2017. The increase was driven primarily by a 2.9% increase in net leased square footage, due primarily to the Merrillville, IN property expansion, and by the results of the Company's revenue rate management program of raising existing tenant rates. Combined store operating expenses for the full year ended December 31, 2018 totaled $3.3 million compared with $3.1 million for the full year ended December 31, 2017. The increase was driven primarily by higher store level employment costs and administrative expenses, which were partially offset by reduced advertising and marketing costs. The Company currently expects Combined store property tax expenses to increase during 2019, primarily due to an expected phaseout of the Class 8 tax incentive granted to the Dolton, IL property and higher assessed values due to the completed expansion of the Company's Merrillville, IN property. For more information on the Company's quarterly and annual results, including financial statements and notes thereto, please refer to the Company's Annual Report on Form 10-K for the full year 2018 filed with the Securities and Exchange Commission today. This press release contains certain non-GAAP financial measures. FFO and FFO per share are non-GAAP measures defined by the National Association of Real Estate Investment Trusts (''NAREIT'') and are considered helpful measures of REIT performance by REITs and many REIT analysts. NAREIT defines FFO as a REIT’s net income, excluding gains or losses from sales of property, and adding back real estate depreciation and amortization. FFO and FFO per share are not a substitute for net income or earnings per share. 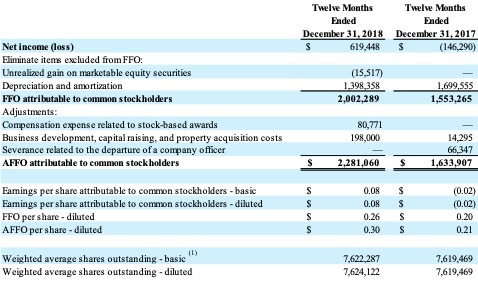 FFO is not a substitute for GAAP net cash flow in evaluating our liquidity or ability to pay dividends, because it excludes financing activities presented on our statements of cash flows. In addition, other REITs may compute these measures differently, so comparisons among REITs may not be helpful. However, the Company believes that to further understand the performance of its stores, FFO should be considered along with the net income and cash flows reported in accordance with GAAP and as presented in the Company's financial statements. AFFO represents FFO excluding the effects of business development and acquisition related costs and non-recurring items, which we believe are not indicative of the Company's operating results. We present AFFO because we believe it is a helpful measure in understanding our results of operations insofar as we believe that the items noted above that are included in FFO, but excluded from AFFO, are not indicative of our ongoing operating results. We also believe that the investment community considers our AFFO (or similar measures using different terminology) when evaluating us. Because other REITs or real estate companies may not compute AFFO in the same manner as we do, and may use different terminology, our computation of AFFO may not be comparable to AFFO reported by other REITs or real estate companies. We believe net operating income or ''NOI'' is a meaningful measure of operating performance because we utilize NOI in making decisions with respect to, among other things, capital allocations, determining current store values, evaluating store performance, and in comparing period-to-period and market-to-market store operating results. In addition, we believe the investment community utilizes NOI in determining operating performance and real estate values, and does not consider depreciation expense because it is based upon historical cost. NOI is defined as net store earnings before general and administrative expenses, interest, taxes, depreciation, and amortization. A reconciliation of this measure to its most directly comparable GAAP measure is provided later in this release. We consider our same-store portfolio to consist of only those stores owned and operated on a stabilized basis at the beginning and at the end of the applicable periods presented. We consider a store to be stabilized once it has achieved an occupancy rate that we believe, based on our assessment of market specific data, is representative of similar self storage assets in the applicable market for a full year measured as of the most recent January 1 and has not been significantly damaged by natural disaster or undergone significant renovation or expansion. We believe that same-store results are useful to investors in evaluating our performance because they provide information relating to changes in store-level operating performance without taking into account the effects of acquisitions, dispositions or new ground-up developments. At December 31, 2018, we owned ten same-store properties and one non same-store property. The Company believes that by providing same-store results from a stabilized pool of stores, with accompanying operating metrics including, but not limited to variances in occupancy, rental revenue, operating expenses, NOI, etc., stockholders and potential investors are able to evaluate operating performance without the effects of non-stabilized occupancy levels, rent levels, expense levels, acquisitions or completed developments. Same-store results should not be used as a basis for future same-store performance or for the performance of the Company's stores as a whole. Certain information presented in this press release may contain “forward-looking statements'' within the meaning of the federal securities laws including, but not limited to, the Private Securities Litigation Reform Act of 1995. Forward looking statements include statements concerning the Company's plans, objectives, goals, strategies, future events, future revenues or performance, capital expenditures, financing needs, plans or intentions, and other information that is not historical information. In some cases, forward looking statements can be identified by terminology such as ''believes,'' ''plans,'' ''intends,'' ''expects,'' ''estimates,'' ''may,'' ''will,'' ''should,'' ''anticipates,'' or the negative of such terms or other comparable terminology, or by discussions of strategy. All forward-looking statements by the Company involve known and unknown risks, uncertainties and other factors, many of which are beyond the control of the Company, which may cause the Company's actual results to be materially different from those expressed or implied by such statements. The Company may also make additional forward looking statements from time to time. All such subsequent forward-looking statements, whether written or oral, by the Company or on its behalf, are also expressly qualified by these cautionary statements. Investors should carefully consider the risks, uncertainties, and other factors, together with all of the other information included in the Company's filings with the Securities and Exchange Commission, and similar information. All forward-looking statements, including without limitation, the Company's examination of historical operating trends and estimates of future earnings, are based upon the Company's current expectations and various assumptions. The Company's expectations, beliefs and projections are expressed in good faith, but there can be no assurance that the Company's expectations, beliefs and projections will result or be achieved. All forward looking statements apply only as of the date made. The Company undertakes no obligation to publicly update or revise forward looking statements which may be made to reflect events or circumstances after the date made or to reflect the occurrence of unanticipated events. The amount, nature, and/or frequency of dividends paid by the Company may be changed at any time without notice.